The gluteus medius muscle is one of the three powerful gluteal muscles that move the femur. What does gluteus medius mean? Gluteus comes from the Greek word “gloutos” which means “buttocks”. This tells us something about where the three gluteal muscles are located. Medius is the Latin word for “middle”. Gluteus medius then, is the middle muscle of the buttocks. In this case it is “the middle” muscle both in size and in location. 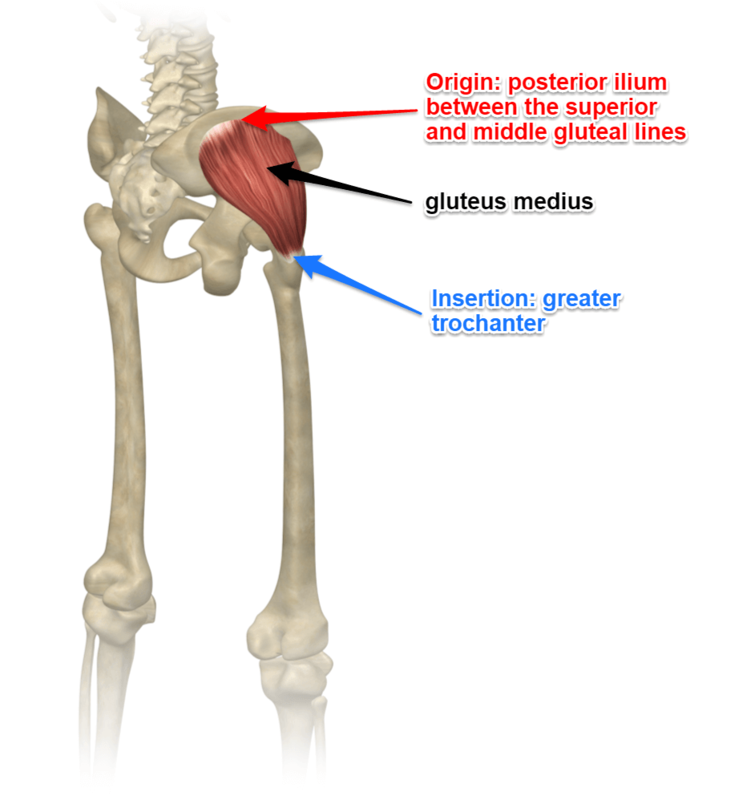 Where does the gluteus medius muscle attach? The three gluteal muscles are found on the lateral side and back of the pelvis. The gluteus medius and minimus are partially covered by the larger gluteus maximus. 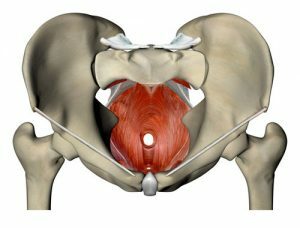 Gluteus minimus and medius are part of a fan of tissues located on the back and side of the hip joint that also include the deep six lateral rotators. The gluteus medius is located deep to the gluteus maximus, but superficial to the smaller gluteus minimus. The gluteus medius originates on the posterior ilium between the superior and middle gluteal lines. The ilium is the bone on the lateral (outside) of the pelvis. You’ll remember from our previous post on gluteus minimus that the gluteal lines are bumpy lines on the outer surface of the pelvis. It inserts on the greater trochanter of the femur. Remember that the greater trochanter is a large bony protrusion or bump felt on the outside of the hip. What actions does the gluteus medius muscle do? All of the gluteal muscles are key stabilizers as well as movers of the hip joint. 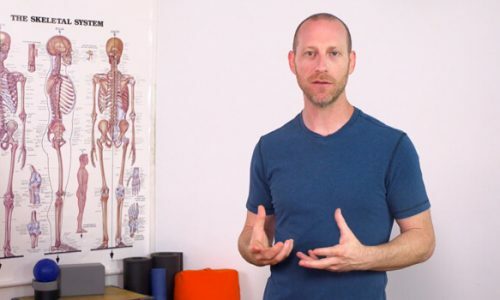 Gluteus minimus and medius specifically work together to stabilize us on one leg when either balancing or while we’re walking. Gluteus medius is the strongest abductor of the femur. It plays a significant role in walking (ambulation). It has anterior fibers which allow it to function in flexion and medial rotation of the femur, in addition to abduction. It also has posterior fibers that allow it to assist in extension and external rotation. 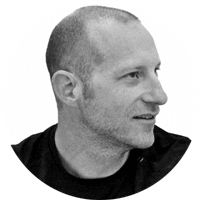 It’s another muscle that is essentially antagonistic to itself in certain movements. Utthita hasta padangustasana, and any other balancing pose, is going to get gluteus medius involved. It contracts strongly in the standing leg of this pose. We do most the lengthening of this muscle when rotating the hip joints. Baddha konasana with an added forward fold would require quite a bit of external rotation in the hip joint and this would definitely lengthen the gluteus medius.